In six half hour episodes, world renowned contributors from both sides of the science/God debate unpack the evidence found in the Cosmos, Life and Evolution and the hidden depths of Mind and Consciousness. Available to buy and watch now or purchase on DVD. 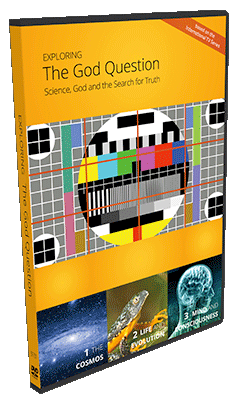 The topics in Exploring the God Question take the viewer on a journey from the beginning of the largest phenomenon in existence – the universe – to the microcosmic world of the human mind 13.8 billion years later. Study guides are available to purchase from our online store – for personal or group study on the themes explored in the programmes. Why not organise your own Exploring the God Question discussion group(s). Find out about the support on offer. Keep up-to-date with 'The God Question' by regularly visiting our website, and in particular our Latest News pages, fascinating Snippets on the topic of God and Science and some Reviews of our products. Kharis Productions, the producers of The God Question series have releaed a special version for schools which is linked to curricula for senior students throughout the UK including those taking the International Baccalaureate. For further information, visit Introducing The God Question. To find out more about the differences bewteen "Introducing" and "Exploring" click here.